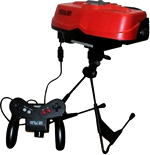 Conceived by Gunpei Yokoi, the Virtual Boy was a headset mounted on legs that used a system of mirrors to produce a stereoscopic 3D effect in its games. Characters could rush in and out of the background, and 3D games could present depth and distance in a way other systems couldn't manage. The system was released in 1995 in both Japan and the United States. Despite its innovations, the system also had many shortcomings. The system's black and red display was reported to cause headaches and nausea, the battery life was poor, and the system's portability was often called into question thanks to its large, unwieldy design. The system failed to gain ground at retail, and after less than a year on the market, and before an official European release, the system was discontinued. The Virtual Boy has since become a highly sought-after collector's item. Regional release lists of games for the Virtual Boy. Designed by Nintendo hardware veteran Gunpei Yokoi, the Virtual Boy consists of a red and black visor with a foam eye shade and a detachable stand. The controller is connected to the port on the bottom of the system, and game paks could be inserted into the base of the headsat at the front. The system featured a headphone jack and an unused EXT extension port, designed for a link cable. The controller was designed with two + Direction Pads on each side, A, B, Start and Select buttons on the face, and L and R triggers positioned at the back. The controller also houses the 6 AA battery power supply for the system. While an AC Adapter could be used, an AC Adapter Tap was required to replace the battery unit on the controller before it could be used.